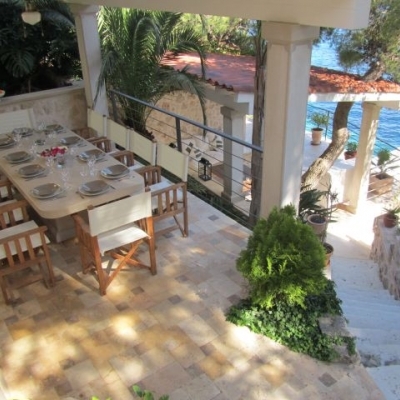 Villa in an exquisite bay not far from the centre of Hvar Town, situated by the sea with private beach and mooring, with the benefit of outside lighting. The villa consists of 5 double bedrooms, each with its own bathroom (WC and shower cabin), a fully equipped kitchen, dining room, sitting room and a second kitchen nearby with sink and refrigerator. Parts of the space are envisaged for staff, and there are areas which could be used for storage of extra equipment or tools. 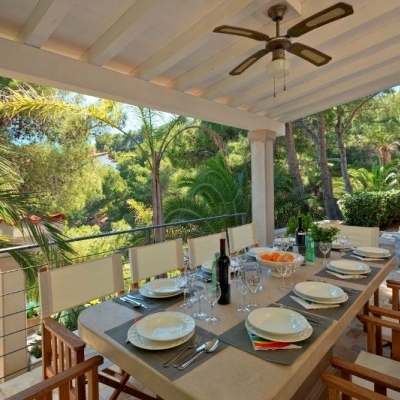 There is an extensive part-open part-covered terrace with loungers, seating, large tables and an outside barbecue - perfect for enjoying good food, fine local wine and other refreshing drinks in congenial company! 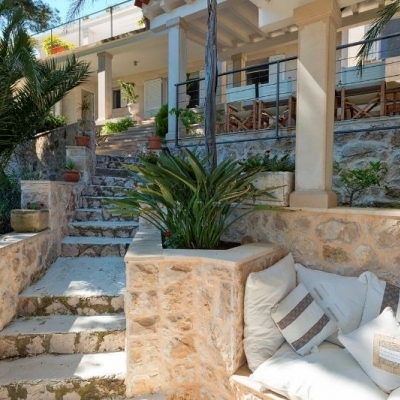 The villa is built of white Brač stone in rustic Dalmatian style, and is surrounded by tall palm trees, pines and various Mediterranean plants.